Did you know that horse lameness affects 50% of all equines? Not only that, but 17% have laminitis, which can cause an average of 110 days of recovery time per episode. Worse, more than 28,000 are euthanized annually because of founder. Ouch! These are the results of the recent Veterinary Services Report from the U.S. Department of Agriculture. 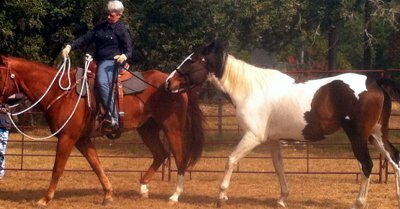 Horse lameness is a big deal, whether you are a backyard horse owner or you show performance horses. Although there are too many possible causes of horse lameness to cover in this article, joint problems are among the most common causes I see in my practice, especially when the joint fluid starts to thin. In young horses, this can happen when they begin training or exercising hard. At this point, the joint fluid can’t properly lubricate the joint, causing wear and tear on the cartilage. As the cartilage wears down, the joint becomes less and less stable. To compensate, the body lays bone down around the joint the stabilize it, causing structural or bony changes. There are several reasons that older performance equines have lameness due to joint problems. First of all, horse joints are areas of the body that do not have much circulation, which in turn prevents the body from healing or removing toxins from those areas. Second, years of hard training and performance can take their toll on joints, wearing down and thinning the cartilage in the joints, or causing arthritic changes. As with most types of holistic horse care, an ounce of prevention is worth a pound of cure, and prevention starts with caring for joints when horses are young. To keep joints healthy in young horses, feed plenty of micro nutrients (from blue green algae, for instance), and avoid overloading the diet with too many calories. Studies have linked diets high in carbohydrates with developmental bone problems like OCD (Osteo Chondrosis Dissecans). To prevent horse lameness for equines in training, feed plenty of good quality micro and macro nutrients, along with minerals and trace minerals. I like the Simplexity APA Blend or Essentials as a general nutritional foundation. Since your horse is exercising hard, you’ll also want to add in antioxidants to neutralize the free radicals being produced from the heavy exercise. Good antioxidants include blue green algae (which has beta carotene), Tahitian noni juice, super oxide dismutase (found in Simplexity’s Super Blue Green Algae), coenzyme Q10, grape seed extract, omega-3 fatty acids, and certain minerals such as sulphur (found in the supplement MSM). Once horse lameness appears, I have found feeding naturally-occurring antioxidants as well as components of joint cartilage to be effective. Components of joint cartilage include chondroitin sulphate, glucosamine, and MSM (products that combine some of these components include Equine Mobility by Standard Process or Cosequin ASU).Two natural herbs, Devil’s Claw and Yucca, can also help. Devil’s Claw (do not feed to horses with ulcers) reduces inflammation without being as irritating to the horse as the non-steroidal anti-inflammatories. Yucca contains organic steroidal saponins, which can limit inflammation.Injectable solutions can also help. These solutions include non-steroidal anti-inflammatory drugs (NSAIDs such as Bute or Banamine) as well as joint components (such as Adequan, Hyaluronic Acid or Legend).